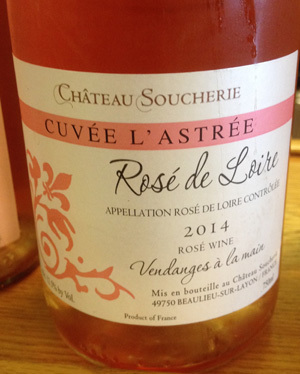 2014 Chateau Soucherie, Rose de Loire “Cuvee L’ Astree” Loire Valley, France. The Soucherie rose of Cabernet Franc from the Anjou region of the Loire is a very stylish and seductive pink, one of my favorites of the Summer and maybe my top pick for Cabernet Franc Rose for the year! I love this wine and adore it’s stunning aromatics, bright tanginess and mineral infused palate, it is wonderfully dry and refreshing in this vintage. The nose is perfumed with hints of violets, rose water and spicy lavender oil, along with a touch of rustic earth, dried herb and cirtus leading to a crisp palate that feels cooly zesty with tart cherry, watermelon, mixed citrus, red peach and a touch of strawberry with a bit of saline, celery, spice and crushed stones. The latest set from Chateau Soucherie are gorgeous wines, especially the classic Anjou Rouge and this pretty and exciting Rose de Loire, be sure to keep an eye out for them, they really are lovely. It is difficult to make Cabernet Franc Rose this complete, alluring and without “green” meanies showing up, so when you nail it like Soucherie, it should be celebrated, and I plan to enjoy many of these bottles! Drink this wonderful pink over the next 6 months, though it should prove interesting for at least a year in bottle or maybe more, though I enjoy it’s energy and verve right now.